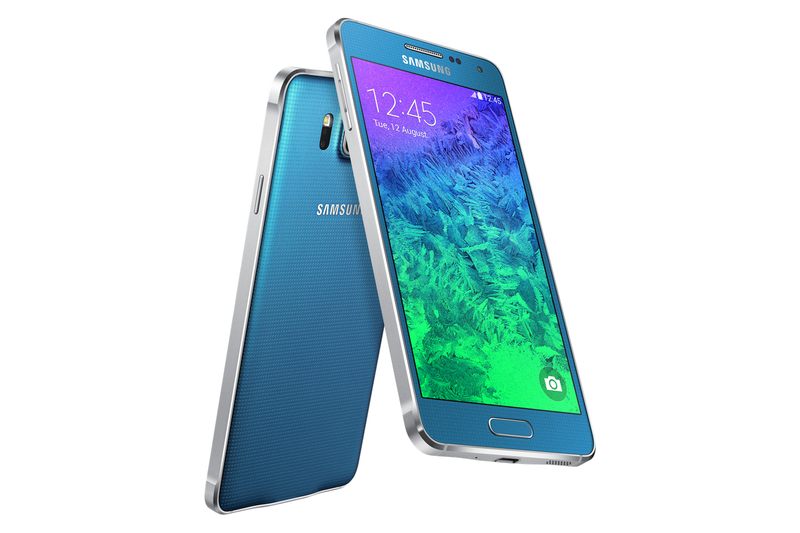 Samsung has debuted its metal-clad Galaxy Alpha after months of speculation. The company announced the device for the Korean market today, adding fuel to the fire that its upcoming Galaxy Note iteration would feature a similar set of materials. The Alpha is not what you would call a high-end device in today’s market, and it’s clear that Samsung is testing the market’s waters with a pre-IFA debut. Sporting a 4.7-inch 1280×720 pixel Super AMOLED display, an updated octa-core Exynos 5430 SoC with a 6-core Mali-T628 GPU, 2GB of RAM, a 12MP rear camera, Android 4.4.4 and an 1860mAh battery, though performance is likely to be top-notch, the Alpha’s advantage is on the outside. At first glance, it looks like an iPhone, with chamfered edges and clean aluminum machining. Even the speaker holes on the bottom resemble that of the iPhone 5 and 5s. The device does maintain its Galaxy-like familiarity with a removable back cover and hardware home button. The backing, however, appears to be plastic. The Alpha is a scant 6.7mm thick and weighs just 115g, which likely explains the smaller battery, but Samsung wants aesthetics to triumph over longevity here. It’s even possible that lowering the screen resolution to 720p was meant to ensure the 1860mAh battery went the distance compared to the company’s other high-end devices. Samsung’s Galaxy Alpha will likely never hit the Canadian market, but it does pave the way for the Korean giant’s promised transition to premium materials, which is necessary to better compete with the iPhone and other high-end Android devices going forward. While Samsung is still the world’s top smartphone manufacturer, last month’s lower-than-expected quarterly earnings mean that the Alpha couldn’t have come at a better time.